«©NCSX» New and factory boxed Multi-Dedicated Wireless Controllerwhich requires an Optec Super Famicom Wireless Receiver before it'll work. Please note today's offer is only for the wireless joypad by itself as shown in our product photos. Unfortunately, we couldn't locate any receivers in our warehouse but we're checking with vendors in Japan for availability. We have a little over 300 of these pads remaining in inventory and zero receivers. Cue the sad sack music. Since it's unlikely that anyone will be able to find Optec Receivers at this point, we're selling these joypads for use as parts. The d-pad is sturdy, the buttons are good, and the wireless transmitter might be useful for some applications. The screws that hold the pad together are standard Phillips for easy disassembly. NCS' remaining inventory is brand new and packaged in the factory cardboard box. The manufacturer Optec decided to use a dearth of packaging material and the pad is packaged inside the cardboard box without any plastic sheath. The condition of the packaging is very good to excellent and has been in storage inside the original shipping boxes. 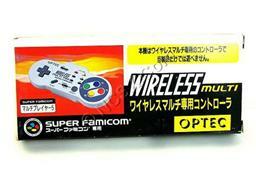 Pricing per Multi-Dedicated Wireless Controller is set at US$12.90 each. If you reside in the USA, NCS recommends USPS Media Mail shipping for the most economical domestic service. International customers are encouraged to select USPS First Class Airmail at approximately US$11. This document is ©NCSX 1994, 2009. All rights reserved. No reproduction in whole or in part of this document may be made without express written consent of National Console Support, Inc.
New and factory packaged Capcom Pad Soldier for the Japanese Super Famicom (16-bit) which features a somewhat twisted design. Official Japanese Nintendo RGB cable which is perfect for use with the XRGB upscan converters and any monitor which accepts the Japanese RGB standard.